BEIJING—Prominent Chinese human rights attorney Gao Zhisheng has been seized by CCP security forces and may be back in prison. This is the latest in a long series of short-term detentions stretching from the first day of Gao's release from prison. This time, however, Gao has not been heard from since being detained, giving rise to the suspicion that this detention is more serious. Since the beginning of September, Chinese human rights attorney Gao Zhisheng has been abducted weekly by Chinese authorities' secret agents for around-the-clock interrogations, say sources. Gao was warned by his captors not to discuss these meetings with the press. On September 21, Gao was removed from his home again, but this time he has not contacted any of his friends as he usually did after his release. Gao's friends are very concerned about his safety, because his silence could mean that he is now in prison. Just before his latest detention, Gao revealed that Chinese authorities were preparing to take actions to “shut him up completely.” He said that they would either remove him from Beijing, putting him in an isolated location two years under the watch of two armed guards, or have officers stationed at his home. 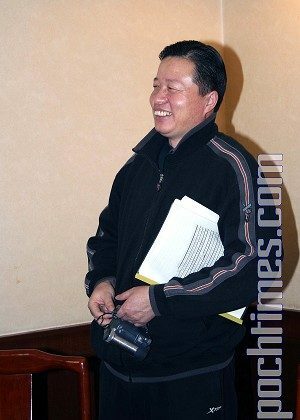 Since Gao was first released from police custody in December 2006, secret agents in civilian clothes have been spying on him from cars in front of his house. Agents keep the cars running for air conditioning in the summer and heat in the winter, and the loud car engines running round-the-clock has become a nuisance to the neighborhood. Before he published any public statements describing his treatment, Gao got into an altercation with agents outside his window due to the noise of their continuously running car. Near the end of an extremely warm August, Gao went downstairs and asked the secret agents to turn off the car engine. The agents rejected his request and beat him up, bruising his right upper arm severely—a full week later Gao's arm remained terribly bruised. Gao picked up a brick and threw it at one of the agents' cars. “Anyone who dares to touch me again, I will fight him to death!” declared Gao. The agents were shocked. The car's hood and windshield were smashed so badly the car had to be towed away. “It will cost tens of thousands of yuan to repair the damage, but we won't ask you to pay for the repair. All we want from you is an apology,” the agents' boss said to Gao. “I have complained to you three times about the noise, but you wouldn't listen,” Gao protested refusing to apologize. The agents had to let it go. On August 27, four Chinese schoolteachers published an article titled, “Interviews with Attorney Gao Zhisheng (2),” the second article of the series. On the same day, Chinese authorities told Gao that they were extremely angry for the release of this article. They accused Gao of playing games, but told him that he wouldn't be arrested for the time being in order to keep things calm. On September 8, Gao Zhisheng's “Solemn Statement” —written on April 20, 2007 and detailing the many abuses that he and his family had endured at the hands of the Chinese communist regime—was published on Minghui.org, Falun Gong practitioners' official website. Many other news organizations later transcribed the statement. At around 7:00 p.m. that day, secret agents removed Gao from his home and took him to an empty room without any furnishings. Gao was not beat up, but stood debating with secret agents until noon the next day—over 20 hours. Gao was not released until the next evening; he went without sleep for over 24 hours. During the long debate, Gao educated the secret agents on the merits of a democratic society and tried to talk them into supporting his cause through non-violent means. Gao warned these officers that they would one day be brought to justice for their actions, and this would even affect their children. On September 10, Monday, Gao Zhisheng and Ms. Huang Yan visited the National Security General Team to investigate the case of Yu Zheng—a tofu vendor who had been abused and beaten by local authorities. However, Gao shocked his friends on Tuesday, September 11 when he said, “I am about to be sent to prison. The day is near. It will be in less than 10 days.” For a few days afterward, Gao continued to publish new articles discussing his detainment, surveillance, and the corruption and cruelty of the Chinese regime. On the morning of September 16, 16 plainclothes officers broke into Gao's home. For several hours, while standing in front of his family, they discussed what they should do about Gao. Gao noticed that they even took minutes for the meeting. “It was the biggest humiliation toward me,” Gao said later. His wife sobbed and the children shrieked, but the secret agents were not moved at all. Instead, they shouted at Gao's daughter Ge Ge, “You take after your father!” Finally, they concluded that they would form an “education reform group” consisting of 16 special agents in four groups, to monitor Gao in turn. When Gao was at home, agents would be there to watch him. When Gao went out, they would follow him closely. When Gao went to work on Monday, four agents accompanied him and stood right outside his office door. Under Gao's strong and fearless protest, agents were temporarily removed from his home. On Friday, September 21—the day he was scheduled to meet with Chinese authorities—Gao began to ask friends to stop calling him. Since then, Gao's mobile phone has been either turned off or gone unanswered. Because Gao had promised that he would try to contact friends once he was released, his friends have become very concerned for him as he hasn't been heard from since September 21. Gao revealed that secret agents working for Chinese authorities took photos of his son, Tianyu, using a flashlight in close range every day in an effort to stop Gao from talking to the outside world. Gao's three-year-old son was frightened and helpless. Gao's wife, Geng He, has become physically and mentally exhausted from enduring constant surveillance and abuse. She often cries in front of Gao. In order to make ends meet, Gao found a job through his friends. However, the secret agents' cars followed him to his office. They even arranged for two agents to work in the same office and sit directly across from Gao's desk. Next, Chinese authorities broke a promise they had made while Gao was imprisoned, refusing to allow his wife and children to obtain passports to go abroad. Agents now threaten Gao with using his wife and children as hostages. Before Chinese authorities broke their promise, Gao had published a number of articles under a pseudonym. Afterwards, Gao spoke out publicly. Each time Chinese authorities have arrested and interrogated Gao, they demanded that he not reveal the arrest or the interrogation. Before Gao published his open letter to the U.S. House and Senate, he actually wished to keep a low profile and requested that the media not run his story.